Narcisi Winery in the spring?! Narcisi Winery in any season is great, but I'm always so excited to get back to playing outside at Narcisi Winery every season. This total request, live looping, acoustic duo show is always a blast and we hope you can join us on the patio from 6-9 pm. Black Dog Wine Company just opened a winery on a beautiful and historic property in Oakdale, Pa on Steubenville Pike. This historic estate is going to be home to some awesome evenings and afternoons of music and I'm excited to be a part of them! Stop out and catch a live looping, all request acoustic show for the special Memorial Day Weekend event!! There’s an amazing spot down by the river in West Newton with a great atmosphere and an incredible drink menu. I’m excited to provide the music Saturday evening at Crooked Creek Distillery. Swing by between 7-10 and have some excellent BBQ food, a sip and a hang!! There are few better places to spend a Friday night south of Pittsburgh than Greendance Winery. I am so glad to be returning for my 10th season of music at Greendance Winery and I hope that you can join me for an outdoor acoustic set in their beautiful garden. I'll be there playing music from 6-9 pm; the wine is there all the time! Narcisi Winery in the summer?! Narcisi Winery in any season is great, but I'm always so excited to get back to playing outside at Narcisi Winery every season. This total request, live looping, acoustic duo show is always a blast and we hope you can join us on the patio from 6-9 pm. Narcisi Winery in the fall?! Narcisi Winery in any season is great, but I'm always so excited to get back to playing outside at Narcisi Winery every season. This total request, live looping, acoustic duo show is always a blast and we hope you can join us on the patio from 6-9 pm. 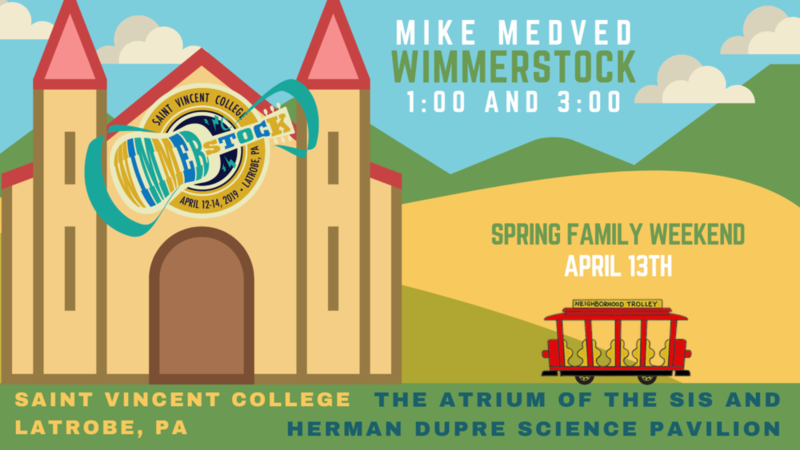 Wimmerstock is a brand new music festival at St. Vincent College in Latrobe, Pa. I’m so glad to return to my home away from home to help launch this awesome new music festival during Spring Family Weekend. I will be performing from 1:00-1:45 and 3:00-3:45 in the beautiful new atrium of the Sis and Herman Dupree Science Pavilion. The Wednesday music series at Narcisi Winery is the best kind of way to break up the week. Stop out between 6-8 for some amazing food and wine and some live music by yours truly. 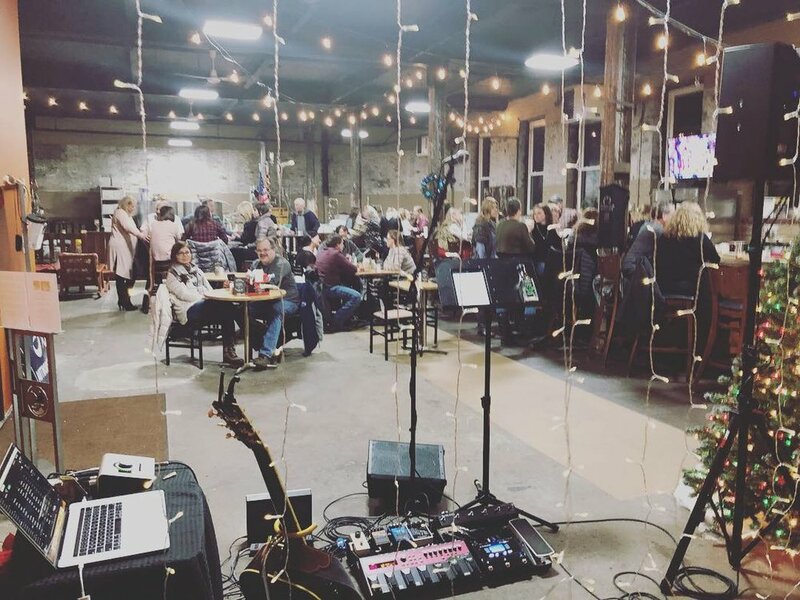 Yoli’s has recently moved in a great spot at the top of Payne Hill in Jefferson Hils (formerly the Payne Hill Grill) and they are hosting a great music series in the spring and summer. I’m glad to be on rotation there this year and I’m looking forward to seeing everyone from 9-midnight for some acoustic jams, song requests and live looping! Black Dog Wine Company just opened a winery on a beautiful and historic property in Oakdale, Pa on Steubenville Pike. This historic estate is going to be home to some awesome evenings and afternoons of music and I'm excited to be a part of them! Stop out and catch a live looping, all request acoustic show inside of this beautiful home! Is your company looking for entertainment for a corporate event? I love providing entertainment for work parties. Feel free to reach out to me using the Contact page! I'll be playing Christmas tunes for the birds and the late night Aviary crowd at their special event called "Holiday Lights and Late Nights." Ticket information can be found at the link in the description. If you are in need of corporate event music or holiday tunes, I love both of those kinds of events. Together, a corporate holiday party makes everybody’s week, including mine! I would love to chat with you about your company’s holiday party music needs. Multiple formats of band are available, from solo to 8 piece! Black Dog Wine Company just opened a winery on a beautiful and historic property in Oakdale, Pa on Steubenville Pike. This historic estate is going to be home to some awesome evenings and afternoons of music and I'm excited to be a part of them! Stop out and catch a live looping, all request acoustic show outside on the patio! Join me for an afternoon of acoustic music on the beautiful patio at Greenhouse Winery!! Narcisi Winery in the late summer?! Narcisi Winery in any season is great, but I'm always so excited to get back to playing outside at Narcisi Winery every season. This total request, live looping, acoustic duo show is always a blast and we hope you can join us on the patio from 6-9 pm. Join us in worship every Thursday night In June and July at The River New Heights in Wexford, Pa from 6:30-7:30. The River is a casual, contemporary church with modern worship and relevant, Biblical teaching. We welcome everyone no matter where you are in your spiritual journey. You won’t find any perfect people here, but you may find new and authentic friends.We take God seriously but try not to take ourselves too seriously. If you’re looking for a church where you don’t have to pretend to have it all together, Come join us! Everyone Matters at THE RIVER. Our church is four years old. We also have another campus in New Kensington that was founded 14 years ago. We exist to help people experience, know and share the love of Jesus. Jesus is at the center of everything we do at The River, and we simply want people to find Him and experience and share that love with the world. We believe Jesus is exactly who He said He is the Son of God, the Savior and Lord of all. That He was crucified, died and was buried and that He rose again to save us from our sins and set us free to live a life of love. We hold to the Bible as the inspired Word of God and seek to live by its teachings. We believe we are called to live lives of Grace, Truth and Love above all else to all people regardless of who they are. -The service contains singing, teaching, multi-media, humor, and prayer. -We provide an outline for the message and scripture passages are shown on screens and included in the outline. Of course, you are always encouraged to bring your own Bible. -We welcome everyone no matter if you have gone to church your whole life, given up on church or this is your first time in a church. There are few better places to spend a Friday night south of Pittsburgh than Greendance Winery. I am so glad to be returning for my 9th season of music at Greendance Winery and I hope that you can join me for an outdoor acoustic set in their beautiful garden. I'll be there playing music from 6-9; the wine is there all the time!